How did fanciful European parlor music influence the creation of the blues? In a more profound way than most fans realize. What follows is one of the most fascinating and least understood chapters in blues history. special thanks is owed to the Kansas Historical Society and its online archive, kansasmemory.org, for making available some of the material that informs this article. In times before radio, records, and electric lights, people often played music to amuse themselves after dinner and at social gatherings. “Parlor guitar,” a favorite European musical fare during the late 1700s, caught on in America. Played with bare fingers on small-bodied instruments, parlor guitar became immensely popular, as evidenced by the stacks of musical scores published during the 1800s. Many of these compositions called for the guitar strings to be tuned to an open chord. The most common of these tunings, open C (with the strings tuned C, G, C, G, C, and E, low to high) and open D (D, A, D, F#, A, D), clearly had European origins. The origins of open G, a favorite banjo tuning, are more difficult to trace. Two parlor compositions in particular would play a crucial role in the development of the blues. On June 29, 1860 Worrall walked into the Clerk’s Office of the Southern District Court of Ohio and filed copyrights for two instrumental guitar songs. 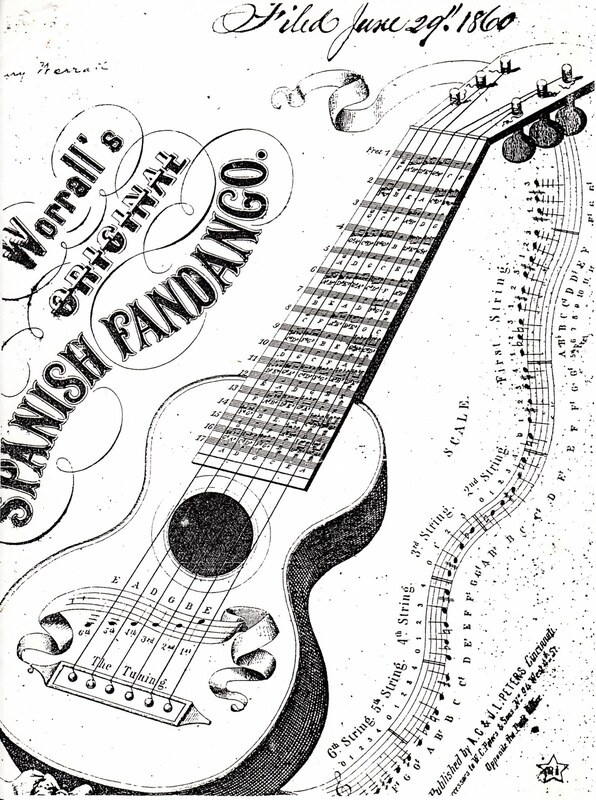 “Worrall’s Original Spanish Fandango” called for the guitar strings to be tuned to an open-G chord (D, G, D, G, B, D, from low to high), with the explanation that the music was to be read as if the guitar were in standard tuning. Some of the song’s flourishes sounded like watered-down versions of earlier nineteenth-century European music. Its little alle vivace finale, for instance, could have worked as a Rossini opera coda. But with its lilting melody and easy chord changes, this song is clearly the direct ancestor of one of the most common blues strains. Two words stand out in Worrall’s title. “Fandango,” thought to be of African origin, first appeared in the English language in the 1760s, used to describe a “native ball,” or dance. Then the term was applied to a lively 3/4 time dance that originated among Spanish-speaking people. An April 1796 playbill for New York’s John Street Theatre, for instance, advertised a “Spanish Fandango” between the play and the afterpiece, listing four dancers and five singers who did not appear in the play. Eventually the word was used to describe the music itself. Of far more interest to blues sleuths, though, is the word that precedes “Fandango” in Worrall’s title, “Spanish.” In the decades to come, this word would echo in the vocabularies of seminal bluesmen such as Charlie Patton, Son House, Robert Johnson, and Muddy Waters. More on this in a moment. 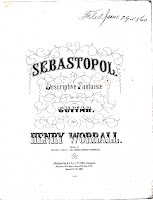 Worrall’s other copyright entry that day, “Sebastopol,” was composed several years earlier, when the Crimean War was raging. 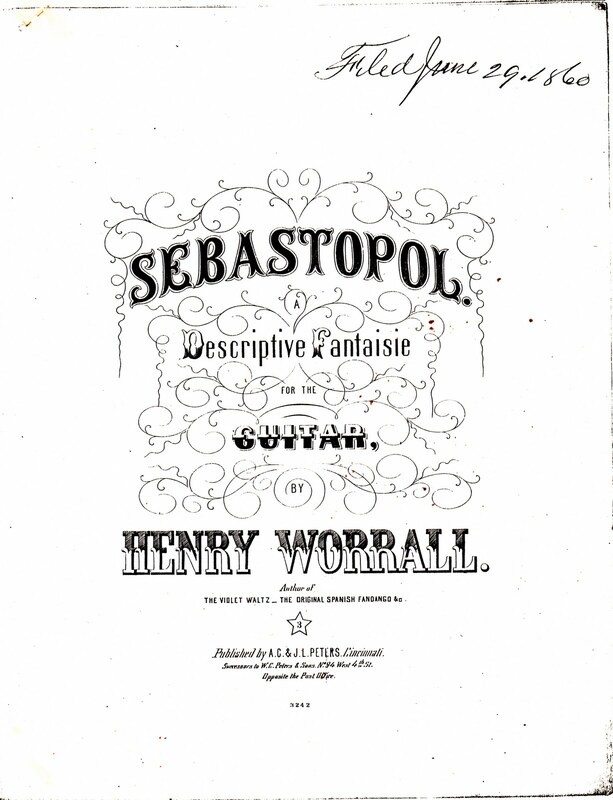 To commemorate the lengthy siege of the Russian city of Sebastopol (later spelled Sevastopol), Worrall composed a stately march that imitated a bugle and military marching band. He subtitled his piece a “Descriptive Fantaisie for the Guitar.” This time, the music instructed players to retune their guitar to open D so the song’s elegant treble-string melodies and chiming harmonics fell easily under the fingers. In its 1860 form, “Sebastopol” has little harmonic variation and sounds decidedly un-African, but its main melody and voice-leading approach to chords became staples for blues and folk performers as varied as Libba Cotten, Robert Wilkins, Mississippi John Hurt, and Furry Lewis. But how did the songs Worrall copyrighted in 1860 enter the blues and folk wellsprings? The answer probably lies in dusty old guitar cases. 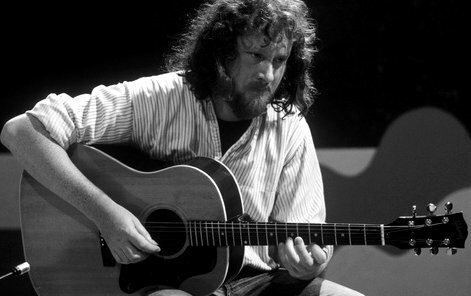 Credit for this research goes to John Renbourn, esteemed British fingerstyle guitarist and avid student of American parlor guitar. In 1992, John sent me the copies of “Spanish Fandango” and “Sebastopol” shown in this blog, along with these revelations: “I have many other parlour pieces in open tunings from around the same time. I am in the process of comparing these with early recorded ‘folk’ versions to see how much of the originals have been retained. It looks as if a great deal has been retained, so much so that these old pieces seem to me to have laid the foundation for the emerging blues and fingerpicking guitar styles. ‘Sebastopol’ and ‘Spanish Fandango’ were both outstandingly popular solo pieces and their availability in print continued beyond the turn of the century. It seems clear that these pieces lent their names to the folk terms ‘Spanish,’ for open-G tuning, and ‘Vastopol’ for open D or open E. But the connections are not limited to the tunings, they go on in terms of harmonic content and even specific right-hand patterns. “What probably happened was this: When guitars began to be mass produced and widely distributed by mail order in the 1890s, they came complete with little tutor books. The most common ones were by a man called Septimus Winner, who almost invariably included versions of ‘Sebastopol’ and ‘Spanish Fandango.’ These fairly simple pieces then would have been the starting point for thousands of rural players around the turn of the century. “Most authorities seem to agree on the various strands of Afro-American music that contributed to the makeup of what we recognize as the blues – the field calls and work songs, etc. – predominantly linear music characterized by what has become known as the ‘blues scale.’ What has never been satisfactorily explained is the origin of the basic harmonic format that distinguishes the blues from these other types. “If you can imagine a field hand sitting down after work and trying to fit an arhoolie [field song] across the basic chords of ‘Spanish Fandango,’ then you would be close to the moment of transformation, in my opinion. In early recorded blues – i.e., Charley Patton and his school – the harmonic language (right down to specific chord shapes but with bluesy modification usually of one finger only) is straight from parlour music. The same is true for early blues in open D compared to ‘Sebastopol.’ It’s fascinating stuff and fairly controversial, but it fills in the missing gap between the steel-string guitar coming in to circulation and the highly developed styles that appeared on recordings in the 1920s.” The first American guitars designed for steel strings date to around the turn of the century. In its 1902 catalog, the Gibson company stated that their guitars could be strung with steel or gut strings. http://www.archive.org/details/JohnDilleshawTheStringMarvel-spanishFandango). Dilleshaw, a 6’7” giant of a man, had learned the song while growing up in north Georgia’s rural hill country. On the recording, one guitarist fingerpicks leads in open G while the other flatpicks basic accompaniment. The musicians have changed Worrall’s sedate 6/8 to a more swinging 2/4 and added alternating bass and bluesy bends, but the final chorus’ droning bass recalls the feel of older parlor guitar pieces. Another early version was released by Bo Carter, the main guitarist with the Mississippi Sheiks and an influence on many Delta guitarists. 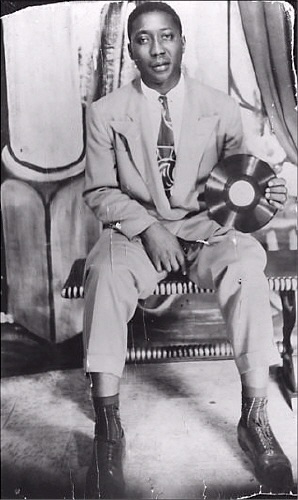 Carter based his song “Country Fool” on “Spanish Fandango” chord progression, but altered the open-G tuning by keeping his highest string tuned to E. This allowed him to pick distinctive treble patterns while retaining a deep, powerful bass. A recently recorded banjo version, played and explained by Patrick Costello, can be heard here: http://www.archive.org/details/TheDailyFrail2310. In the 1950s, another Delta-bred, Chicago-based blues guitarist, Elmore James, used an open-D-tuned electric guitar to kick-start “Dust My Broom” with what is surely the most imitated slide riff in all of blues. 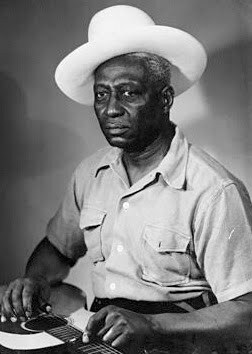 During the 1960s, “rediscovered” or newly discovered old-time artists including Mississippi John Hurt, Sam McGee, Mance Lipscomb, and Elizabeth Cotten recorded acoustic versions of Worrall’s tunes. Soon Jesse Ed Davis, Johnny Winter, Duane Allman, and others were carrying open G and open D into mainstream rock and roll, and these tunings still thrive today. And whether they know it or not, anyone who uses them owes at least a passing nod of appreciation to Henry Worrall. But whatever happened to old Mr. Worrall? I am delighted to report that he led an amazing life. In 1869 he moved to Topeka, Kansas, for his health. For decades he gave guitar concerts and lectures and played organ in church. He became a celebrated painter and illustrator, his artwork appearing in important books on Western history and the nationally popular periodicals Harper’s Weekly and Frank Leslie’s Illustrated Newspaper. His famous oil painting “Drouthy Kansas” convinced people around the country that the great Kansas drought of 1860 was indeed a thing of the past. Worrall carved wood – including the Kansas State Seal – and invented several wind and hay instruments. He cultivated grapes and kept a large vineyard. He was well known for his pranks, and into old age he enjoyed accompanying male pupils as they serenaded girls in local colleges. This delightful man passed away in 1902. Today, the Kansas State Historical Society makes an impressive collection of original Henry Worrall materials available to researchers. Are you listening, Ken Burns?